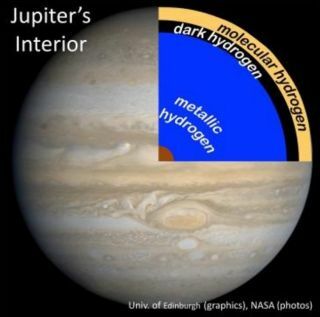 Laboratory experiments suggest that a layer of "dark hydrogen" lies between the atmospheres and cores of Jupiter and other gas giants. Exotic "dark hydrogen" lurks within giant planets such as Saturn and Jupiter, a new study suggests. This strange form of hydrogen likely lies between the gaseous hydrogen in the clouds of gas giants such as Saturn and Jupiter and the liquid-metal hydrogen found in these planets' cores, according to the study. "This dark hydrogen layer was unexpected and inconsistent with what modeling research had led us to believe about the change from hydrogen gas to metallic hydrogen inside of celestial objects," co-author Alexander Goncharov, a physicist at the Carnegie Institution for Science in Washington, D.C., said in a statement. Goncharov and his colleagues used a laser-heated "diamond anvil cell" to create the conditions likely to be found inside gas giants. Probing hydrogen under pressures ranging from 10,000 to 1.5 million times that found in Earth's atmosphere, and through temperatures as high as 10,000 degrees Fahrenheit (5,500 degrees Celsius), they discovered an intermediate phase of the element. Jupiter, Saturn, Neptune and Uranus all have gaseous hydrogen atmospheres that extend all the way to their mantles. A layer of liquid metal hydrogen lies within their cores. Dark hydrogen may separate the boundary in between, the researchers said. Dark hydrogen is so named because it doesn’t transmit or reflect visible light. However, the stuff does transmit infrared radiation. "This observation would explain how heat can easily escape from gas giants like Saturn," Goncharov said. Dark hydrogen is slightly metallic and can conduct an electric current (though not as well as liquid-metal hydrogen does). The material likely plays a role in creating magnetic fields around the planets of the outer solar system, the researchers said. The research, which was led by R. Stewart McWilliams of the Carnegie Institution, Edinburgh University in Scotland and Howard University in Washington, D.C, was published last week in the journal Physical Review Letters. Follow Nola Taylor Redd on Twitter @NolaTRedd or Google+. Follow us at @Spacedotcom, Facebook or Google+. Originally published on Space.com.